Conventional wisdom has it that Connecticut is a sort of a nice place. You know, rich history, colonial charm, high-class suburban/exurban atmosphere, etc. It acquired that reputation many years ago when all those famous New York folks took up residence in the Nutmeg State and commuted to New your on the New Haven Railroad, to their upscale jobs in advertising, publishing etc. Quite some time ago, a wit characterized the Connecticut population as consisting of of geniuses, commuters and clamdiggers. The geniuses were the literary types who could work at home but needed to be reasonably close to their New York publishers, commuters were, well, commuters, and clamdiggers were the rest of the population — indigenous folks who made their living locally. But all in all, it was thought to be a nice place. The Kelo case, and more particularly its aftermath shone a different light on Connecticut. It turned out that, not only was Connecticut a legal snake pit when it came to eminent domain — it singled out for destruction an unoffending lower class community in New London for the sake of fattening the purse of the Pfizer pharmaceutical company, earning for itself widespread and well-earned opprobrium, but it was defiant about it afterwards even though the redevelpment project that gave rise to the Kelo case proved to be an utter duisaster that produced nothing even as it consumed somewhere around $100 million in public funds. But in a sense, worse was what happened in Connecticut later. Nothing. Unchastened by the Kelo disaster, the Connecticur legislature became one of the minority among the states, that failed to rectify its eminent domain laws — not even in some token way. Now, we learn that the Kelo disaster was not the only such event in Connecticut. Though it did not receive publicity like Kelo, the events in Bridgeport are even worse. We commend to our readers an article in the Hartford Courant, by Robert S. Poliner, the former Ombudsman for the State of Connecticut, entitled Eminent Domain: Taking Control, January 31, 2010 (go to http://www.courant.com/news/opinion/hc-commentarypoliner0131.artjan31,0,6681560.story ). In it we learn that the redevelopment efforts in Bridgeport made New London look like a piker. Starting in 1970 Bridgeport began its Steel Point redevelopment project. That’s sright, 1970 — that’s 40 years ago. It acquired some 52 acres. What did it produce? Nothing, zip, nada, bobkes, even though its redevelopment plan was revised eight times. Fortunes have been frittered away on that one, an now some Bridgeport honcho says that it may take another 25 years to get on with it. But you ain’t heard nothin’ yet. Mr Poliner also tells us about the incredible — that’s “incredible” as in unbelievable — story of Connecticut DOT setting out to condemn a 17-acre parcel it needed for a highway project. But instead, it took a 108-acre tract of land containing a quarry with some 15 million tons of unexcavated stone in it, and paid $4.1 million. Actually, the word “paid” is a term of art in Connecticut. Over there they don’t have any kind of impartial judicial determination of value in eminent domain cases — the condemnor just makes a unilateral determination and deposits whatever it thinks is “just compensation,” acquiring instant title. If the owners are dissatisfied with that, it’s up to them to hire a lawyer and appraiser, and file a lawsuit, if they want any kind of impartially determined compensation. This is what happened in the quarry case. But it turned out that though it deposited only $4.1 million, DOT had two independent appraisals valuing the property at $14 million to $18 million, and its own estimates indicated a value of perhaps as much as $30 million — a 108 acre tract of land with 15 million tons of quarry quality stone in it ain’t hay. As Poliner tells it, “. . .the DOT hired an out-of-state appraiser with questionable credentials who said the entire property was worth only $2.36 million. He was paid $240,000.” Wow! It may not come as a surprise to the readers of our “Lowball Watch” posts, that the judge’s award (they don’t have juries in Connecticut) came to $22.90 million, plus interest of $18.8 million. What makes this saga of particular interest is that according to Poliner, the Connecticut Attorney General declined to appeal this case, so that’s that. So let’s be thankful for honest judges. We recommend that our readers with an interest in inverse condemnation read a new article by J. David Breemer, Ripeness Madness: The Expansion of Williamson County’s Baseless “State Procedures” Takings Ripeness Requirement to Non-Takins Claims, 41 The Urban Lawyer 615 (2009). The anomalous Williamson County rule requires that property owners — unlike any other species of constitutionally aggrieved plaintiffs — must first pursue their takings claims in state courts before those claims become ripe for litigation in federal courts. But when such plaintiffs do exactly what Williamson County requires, they are met in federal court with the defense that the state court adjudication triggers the doctrine of res judicata which now bars their federal action. In other words, their federal constitutional claim is said to become ripe at the precise moment it becomes barred. This outlandish result has been noted not only by numerous commentators (see commentaries collected at 41 The Urban Lawyer at 615, fn. 3), but also by four U.S. Supreme Court Justices in the wretched San Remo Hotel case. Mr Breemer now demonstrates that this unprincipled maverick legal doctrine has been seeping from takings cases into others, like due process and equal protection claims involving property, where apart from its inherently anomalous nature it lacks any doctrinal bases whatever, even under Wiliamson County. 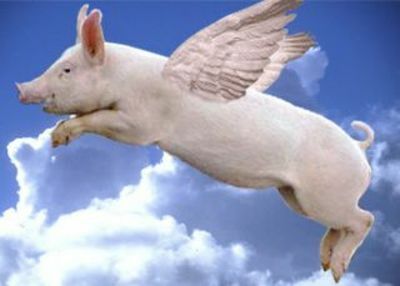 Our view of that thankless endeavor is that there will be eminent domain reform in New York when pigs learn to fly. That state has over a period of decades evolved such a kleptocratic legal culture that we have difficulty seeing what forces would take the lead in getting the legislature to make effective reforms. And as for New York judges, . . . Just read up on how judges are picked in New York. It’s all there in the archives of the New York Times. So we offer our best wishes to the beleaguered New Yorkers trying to keep their property out of the clutches of local redevelopers, or at least to be fairly compensated when their property is taken. As that old, politically incorrect punchline from an old World War II joke went: Rots of ruck, guys. Is the Movie “Avatar” a Story About Eminent Domain? Our colleagues at the Nossaman law firm run a blog on eminent domain, http://www.californiaeminentdomainreport.com as they have every right to do. What makes theirs different from ours is that we are unabashedly property-owner oriented, being mindful of the fact that the “public use” limitation on takings is so much “hortatory fluff” as Justice O’Connor put it in her Kelo dissent, and of judicial confessions that the “just compensation” promised by the taking clause of the Fifth Amendment is neither just nor compensation. It’s sort of like the Holy Roman Empire, of which historians said that it was neither holy, nor Roman, nor an empire. The U.S. Supreme Court has conceded that eminent domain is “harsh,” rather than just, and that the judicially-defined “fair market value” does not follow what the market actually does. Our own California Supreme Court has allowed as how anybody who takes the judicial “panoramic” expressions about fairness, justice and indemnity seriously, just plumb doesn’t understand eminent domain law. The Nossaman folks, on the other hand, give every indication of being condemnor-oriented, which is also their right. But sometimes folks can get carried away by their own rhetoric, and the Nossaman post of January 27, 2010, Is Avatar Really a Political Commentary on Eminent Domain Abuse? is a case in point. Strangely enough, we are in agreement with Mr. Rick E. Rayl (the author of the Nossaman post in question) that the movie Avatar has nothing to do with eminent domain. Since a number of people have latched on to the idea that the cinematic conquest of the fictional plantet Pandora is an act of eminent domain, it seems only reasonable to dispel that mistaken notion. Avatar is a story of conquest which under our law is governed by entirely different legal principles than eminent domain which is an inherent attribute of sovereignty, or of governance. You can check that out by reading Chief Justice Marshall’s opinion in Johnson v. M’Intosh, 21 U.S. 543 (1823), where he explained that when land is conquered, the conqueror not only displaces the sovereignty of the conquered entity, but actually acquires title to the conquered land. Thus, as the U.S. District Court explained recently in Delaware Nations v. Commonwealth of Pennsylvania, 2004 Dist. LEXIS 24178, aff’d. 2006 U.S.App. LEXIS 11085, the tribe’s aboriginal title was extinguished when its land was conquered and the justness of that sovereign act was not justiciable. So why are we going on about these things even as we agree with Mr. Rayl’s bottom line? Good question. In his post, Mr. Rayl offers four reasons for distinguishing Avatar from our eminent domain procedures, that, alas, fall short of an accurate representation of our law. They are (1) the “acquisition” in Avatar was handled by a private company, (2) There was no pretense of public use, the company seizing the mineral “unobtanium” wanted it for its value as a manufacturing component of some sort, (3) there was no established right to take because “there was no resolution of necessity,” and (4) there was no payment of just compensation. Unfortunately, none of these factors are wholly correct. First, one need not be a government entity to exercise the power of eminent domain. In California, anybody, yes anybody, including your grandma, may exercise the power of eminent domain for a public use established by statute. Linggi v. Garovotti, 45 Cal.2d 20, 286 P.2d 15 (1955). See California Civil Code § 1001, and if you want to have real fun, check out its pre-1975 version. In other words, it’s the use that has to be public, not the user. Second, The taking of minerals is not a “public use”? Sorry. Takings for the purpose of extraction of minerals are routine. Strickley v. Highland Boy Gold Mining Co., 198 U.S. 361 (1905). See United States v. Pewee Coal Co. 341 U.S. 114 (1951) for a discussion of valuation in such cases. In fact, that is one of the old established principles of common law of England – see The Case of the Kings’ Prerogative in Saltpetre, 77 Eng.Rep. 1294 (K.B. 1606) (taking of saltpeter for the manufacture of munitions was not tortious, as it was an act in defense of the realm, so there was no trespass, but the Crown had to pay for the removed saltpeter). Third, in California, a resolution of necessity is indeed required when one files a lawsuit in eminent domain, but not otherwise. As the U.S. Supreme Court held, the government may just take property, and then it is up to the property owner to sue if he wants to get paid. That’s what inverse condemnation is all about. The U.S. Courts of Appeals for the Fifth and Ninth Circuits phrased it by saying that the government may just seize property and say to its [former] owner “sue me.” In haec verba. Also, Congress may engage in “legislative expropriation” and pass a bill that transfers title to the subject property from the owner to the government, without due process of law, and here too it’s up to the owner to sue for compensation. That is how the Redwood National Park was created. Bottom line: No, the Avatar plot is not about eminent domain, but that is so for entirely different reasons than those marshaled by our friends at the Nossaman blog. Now, it appears that we will have to go see the thing without awaiting the arrival of the DVD, even if it appears to be another exercise in political correctness. We can’t wait to see yet another story a la Dances With Wolves, in which the bad guys are white men and the victims are persons of color, even if the color is blue in this one. Where is Captain Kirk, the good white guy, when we really need him? Yor faithful servant has no intention of offering a reply to Mr. Rayl’s views – we both have had our say about Avatar, and we agree on the bottom line, so let the best man in the eyes of the reades win. However, Mr. Rayl has — unintentionally no doubt — delivered two mortal insults that do call for a refutation. First he characterizes your servant as a “scholar.” Have a care, sir, and perish the thought! “Technician” would be more accurate. These days, legal scholars tend to produce impenetrable law review articles about meta-hermeneutics, and they explain to their bewildered students what was the influence of Kant on the critical legal studies movement, while the bewildered students are surprised to learn that Kant was person. O tempora, O mores. Your servant, on the other hand, taught the tads law and how to practice it — including the vital information on where to find restrooms in the courthouse. Second, Mr. Rayl appears to be laboring under the misapprehension that your servant’s knowledge of the field is — shudder! — “academic.” Perhaps the readers can run the names of the two of us through Lexis or Westlaw to find out what our respective practice credentials are. If that’s too much effort, click on the word “About” in the upper right-hand corner of this blog, though it won’t list the cases your servant has handled — for those you will have to go to Lexis et al. Jim Matson’s blog, Grand Theft: Property, reports in a post of January 25, 2010, that the State of Florida has finally paid for its taking of property that began by the state filing a slow-take condemnation action in 1995, and offering $160,00. In 2004 the state filed a quick-take of the subject property, and raised its deposit to $630,000. The verdict was $8.85 million. Why the large difference? The state was trying to take advantage of restrictive land-use regulations that had been imposed on the subject property, by valuing the land as so restricted. CLE International has announced that it will hold its 12th annual program on eminent domain at the Millenium Biltmore Hotel in Los Angeles on April 12-13, 2010. The program will feature last year’s legal developments in California, as well as presentations of various substantive topics dealing with trial techniques, valuation, and with coming new projects. The keynote presentation will feature three retired judges who will discuss the use of mediation in eminent domain cases. For further details and a copy of the program brochure, contact CLE International, 1620 Gaylord Street, Denver CO 80206, telephone (800) 872-7130. The Illinois Supreme Court has decided the Prologis case (City of Chicago v. Prologis, Docket No. 106805, opinion filed January 22, 2010). It affirmed the lower courts’ holdings that Prologis, a holder of revenue TIF bonds issued by the Village of Bensenville to finance a redevelopment project, was not entitled to compensation when the redeveloped property that generated the tax revenue used to service those bonds, was condemned for the expansion of the Chicago O’Hare Airport. The condemnation transfered title to the property to the city of Chicago, so it became tax-exempt, and the tax revenue stream dried up, making the TIF bonds worthless. The court relied on Omnia Commercial Co. v. United States, 261 U.S. 502 (1923), and John K. & Catherine S. Mullen Benevolent Corp. v. United States, 290 U.S. 89 (1933). Omnia held that when a contract is frustrated when the government takes the subject of the contract, but not the contract itself, no compensation is due. The Mullen case held that when the taken property does not formally secure the bonds, but is only used as a source of tax revenues used to service them, the bondholders’ property interest in the subject property (which they then do not have) is not taken, and so they are not entitled to compensation. The court noted that the bond indenture spoke of tax revenues “if any” and emphasized that the claimants were sophisticated investors who understood the risk inherent in purchasing revenue bonds (the bond indenture contained explicit language to that effect) so the court was of the view that the bond holders assumed the risk. So the moral here would appear to be that he who lives by the redevelopment sword, dies by it. The big news from the Supreme Court last week was its decision in Citizens United v. Federal Election Commission, in which the court struck down statutory limitations on campaign contributions, notably holding that corporations, the same as individuals, have a first amendment right to advocate political positions, and that laws denying them that right are unconstitutional. So what does that have to do with eminent domain? Read on. There is a wrinkle in this decision that is of interest. Justice Stevens dissented in Citizens United, complaining among other things, that the majority improperly expanded the issues it decided, beyond those presented by the petitioners. The SCOTUS blog also notes that, and observes that the court held over Citizens United from last term, and ordered reargument in order to address those expanded issues. “In light of this Court’s clear holding that a temporary moratorium on land use can require compensation for a temporary taking of property (First English Evangelical Lutheran Church v. County of Los Angeles, 482 U.S. 304 ), is it permissible for the Ninth Circuit Court of Appeals to hold – as a matter of law – that a temporary moratorium can never require constitutional compensation?” Emphasis in the original. What’s the difference between the two versions? The Petitioners’ formulation addressed the issue of whether lower courts may depart from the Supreme Court’s First English holding that as a matter of law a moratorium could be a temporary taking, whereas the 9th Circuit asserted that, on the contrary, a moratorium could not be a taking because of its temporary nature. Thus, the rewritten question enabled the court to duck the question of law presented by the petitioners, and to deal solely with the specifics of that case rather than with the far-reaching rule laid down by the 9th Circuit. Stevens was thus able to acknowledge that a moratorium could be a taking, while still ruling that this particular moratorium was not a taking, allowing him to affirm the opinion below even as he acknowledged indirectly that the 9th Circuit was wrong. This reformulation of the question presented also allowed Justice Stevens to press the owners’ lawyer in oral argument as to whether any moratorium – perhaps one as short as a few minutes – would be a taking. This reduced the substantial question of law presented by the petitioners who had been denied the right to build individual homes on their lots for a period of years, to a word game over whether short, de minimis interdictions of land owners’ right to build a home are takings. We have no way of knowing whether Justice Stevens rewrote the petitioners’ Question Presented, but since he eventually wrote the majority opinion holding that this “temporary” moratorium was not a taking, it seems fair to suppose that either he did it or it was done by a clerk at his direction. As readers of this blog know, between the Atlantic Yards case (Goldstein v. Pataki) and the more recent Kaur case (of which more presently), New York has been roiled by a huge and evidently growing controversy over the use of eminent domain to wrest homes and businesses from unoffending people and turn their sites over to assorted local fat cats for the latter’s profit. It all reached a crescendo lately when the highly regarded Washington Post columnist, George Will, devoted two of his recent columns to lambasting New York for its abuse of the eminent domain power for private benefit. True, the New York Court of Appeals has not gone as far as the U.S. Supreme Court in the notorious Kelo decision – it continues to pay lip service to “blight” as justifying takings, but its use of “blight” as a justification isn’t even a good linguistic subterfuge. In New York anything the condemnor calls “blight,” no matter how absurd, is obediently rubber-stamped by the local courts. They may talk a good game about being guardians of the people’s constitutional rights, but when it comes to enforcement of the constitutional “public use” limitation, they neither see, nor hear, nor speak evil. In other words, in New York, “blight” is whatever the condemnor says it is, even when it plainly isn’t. “In the many years since Kaskel [v. Impelliteri], agency blight findings have been found deficient in this State only where they were utterly unsupported, and there has been no case in which the condition of an area has been deemed sufficiently at odds with an agency blight finding to raise a factual issue as to whether the agency exceeded its authority in making the finding. This is not because limits of the blight concept have been untested. Indeed, if ever a claim of blight challenged one’s common-sense understanding of the term it was in a case ‘in which the city urged that the Coliseum site at Columbus Circle (now the location of the Time Warner Building) – undoubtedly, even at the time of litigation, one of the most valuable pieces of real estate in the City, bordering on the very exclusive southwestern corner of Central Park – was blighted and thus appropriate for designation as an urban renewal site. This Court, however, citing Kaskel, and accepting the city’s contention that the site was outmoded, underbuilt and insufficiently utilized, found the proposed designation [of blight] proper notwithstanding the site’s obvious, indisputable potential for private development. The point to be made is that ‘blight’ has proved over time to be a highly malleable and elastic concept capable of enormously diverse application.” Develop Don’t Destroy Brooklyn v. Urban Development Corp. (App.Div. 2009) 874 N.Y.S.2d 414, 424, emphasis added, citations omitted. There you have it: the conduct of New York’s condemning agencies has achieved such a state of civic perfection, that their findings of “blight” do not even raise any factual issues, and are thus simply beyond debate. So it was a bombshell when the New York Appellate Division, First Department, filed its opinion in Kaur v. New York State Urban Development Corp. (2009) 2009 N.Y. App.Div. LEXIS 8799 (December 3, 2009), and upset the apple cart. The taking in that case was for the benefit of Columbia University. Columbia wanted to expand into the Manhattanville area, and the city obediently set up a redevelopment project to satisfy Columbia’s desires. We could expend a lot of ink and paper describing the contents of this opinion, but if you have a real interest in eminent domain you simply have to read it for yourself. For once, the court refused to swallow whole the “findings” of blight because upon examination of the record it became clear to it that the “findings” were a tissue of conflict of interest, denial of due process of law, and manipulation of the administrative record. It isn’t every day that a court uses epithets to characterize a government finding, but here it did – with justification. Naturally, the city plans to seek further review by the New York Court of Appeals (that state’s highest court), and at the moment, if we had to bet, we would bet, alas, on the city. Why? Not because its case is the better one – logically and doctrinally it isn’t – but because as demonstrated by the above Appellate Division quote, the New York judiciary is so biased on this subject that, in our opinion, its decision is a foregone conclusion. Still, we would like to be wrong on that one, so let’s all stay tuned and see what happens. It is possible that the country’s angry reaction to Kelo (which shows no signs of going away), combined with the outrageous specifics of the Kaur case may give those judges pause, so it is possible, just possible, that they may actually try to shoulder their moral burden and civic duty, and review the horrifying record in the Kaur case with a modicum of impartiality. It is also possible that your faithful servant will win the Megasomethingorother lottery, but we suggest you don’t hold your breath until then. So who is this Kathryn S. Wylde? Is she perhaps some anti-property rights activist? Some radical prole? Actually, no. She is a prominent business leader who is identified by the Times as chief executive of the Partnership for New York City, “a leading business group.” Yep. A leading business group supports takings of business properties of others for the benefit of its own members. Which in New York means confiscating businesses of others, because New York law does not allow recovery of any compensation for business losses suffered in eminent domain cases. All this reminds us of an expression attributed to V. I. Lenin who supposedly said that when the world’s last capitalist is hanged by the revolutionaries, he will swing from a rope sold to the revolutionaries by the next to last capitalist. Maybe ol’ Vladimir Ilyich didn’t actually say that, but if he didn’t he should have. And if this allusion to a communist tyrant strikes you as inappropriate, reflect instead on the lesson of the Bible which teaches that men are ever ready to sell their birthright for a mess of pottage . Make that men and women. The annual ALI-ABA program, Eminent Domain and Land Valuation Litigation will take place on February 4-6, 2010, at the Westin Kierland Resort in Scottsdale, Arizona. Concurrently with this program, ALI-ABA will put on a companion program, tailored to needs of practitioners who are new to eminent domain, entitled Condemnation 101: How to Prepare and Present an Eminent Domain Case. These are usually excellent programs — the first one is widely regarded as the best eminent domain CLE program around. It will present coverage of a variety of topics, both legal and practical, presented by experienced practitioners and appraisers. In addition to the regular, plenary sessions, the program will also have concurrent afternoon breakout sessions on a variety of selected topics. Inverse condemnation will also be covered.